Indeed, Anton Rubinstein's impressive output has lead to charges of quantity being placed above quantity, nor has he been helped by the one-hit-wonder status resulting from his once ubiquitous Melody in F. His star as a composer might not exactly be in the ascendency these days, but his works are seeing the light of day with certain regularity. Valery Gergiev recently championed his opera, The Demon, with his Mariinsky forces at the Barbican and the fact that Hyperion makes a speciality of the less well-known corners of the romantic piano repertory means that his works have been popping up occasionally in that label's catalogue, not least Marc-Andre Hamelin's typically impressive recording of the fourth piano concerto in the Romantic Piano Concerto series. 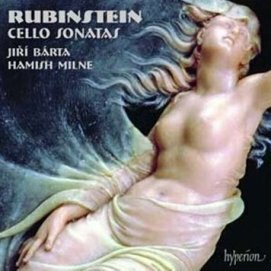 Now we have a disc two cello sonatas which show Rubinstein's natural melodic gift and considerable compositional craft to great advantage. Like a couple of other composer-pianist's works for the same combination – one thinks of Rachmaninoff and Chopin – the piano's role is quite substantial, but Rubinstein writes very idiomatically for the cello, too, and the result is a pair of very enjoyable, well balanced works. Dating from the 1850s, the the sonatas are products of Rubinstein's twenties and, as Calum MacDonald notes in his excellent booklet essay, show refined style reflecting much time spent in Germany, slightly reminiscent of Mendelssohn and occasionally Brahms. The first sonata is cast in just three movements and the second in four; both works, rather unusually, finish with substantial moderato movements as finales. Those expecting sonatas, then, full of extravagant swirls of Russian Romanticism and folk-inflected dances will be a touch disappointed. However, with Jiřì Bárta and Hamish Milne, we have interpreters who capture not only the well-crafted elegance but plenty of the fire that might be concealed, but is never far away. The performers are more than up to the considerable technical challenges Rubinstein makes of both instruments, too. Bárta particularly brings an urbane musicianship to all that he does, while Milne is unfazed by the often extremely complicated accompanimental figures the composer conjures up. I felt that there could have been a bit more passion towards the end of the first sonata's opening movement, but the haunting Moderato assai that follows – apparently a movement that enjoyed a certain independent existence as a salon piece during the nineteenth century – is performed beautifully, with the requisite mixture of light and shade; Bárta's quick figurations about three minutes in, answered by Milne's gently surging riposte, are particularly well done. The finale's moderato marking is rather misleading, since it is a lively and powerful movement, with a certain, almost heroic character it also makes some considerable demands of the pianist, in particular, negotiated with easy facility by Milne. The four-movement second sonata kicks off with an expansive Allegro developed with imagination and skill, with the writing for both instruments a notch more expressive and ambitious, with a fair amount more in the way of rhythmic and melodic variety. The second movement Allegretto is in the form of a more conventional scherzo with trio, making a feature of an elegant repeated note idea. The Andante gives the cello its first real chance to sing out a long-breathed melody, an opportunity grasped by Bárta who shows off some very seductive playing. Rubinstein develops the material with a disciplined dreaminess that builds up into some passionate outbursts and makes use of a moving descending sequence, all captured expertly by the players. Again the final movement's moderato marking is distinctly misleading as this twelve-minute finale makes even greater demands on the performers, asking for passion and lightness of touch by turns – the opening idea of sweeping arpeggios in the piano answered by a mischievous cello idea is typical of this – and culminating in big, passionate coda. With these idiomatic and virtuosic performances it's difficult to disagree with the concluding thoughts of MacDonald's booklet: these two sonatas surely deserve entry into a cello sonata repertoire which might have its share of masterpieces but is a long way off saturation point.